Citation: Lopes, J.T. Adapted Surfing as a Tool to Promote Inclusion and Rising Disability Awareness in Portugal. Journal of Sport for Development. 2015; 3(5):4-10. Adapted surfing is an outdoor activity that takes place in naturally and constantly moving water and appears innovative compared to other traditional adapted sports (such as swimming or sailing). It has a wide approach that covers several areas of Occupational Performance10 (ADL´s – Activities of Daily Living; Education/Work; Play, Leisure and Social Participation) as well as various physical, sensorial and psychosocial skills. Surfing can play a significant role in the lives of people with disabilities by promoting physical well-being, combating discrimination, building confidence, as well as playing an important role in the rehabilitation process. Adapted surfing is a complete, integral, therapeutic and inclusive activity due to its diverse features associated with performance in areas of occupational performance, performance skills and also different environmental contexts. We can identify four major factors that focus on the intervention through surfing: Aquatic Environment; Environment – Individual Interaction; Individual – Coach/Therapist Interaction; and also Group Interaction. Since 2012, the Portuguese Association of Adapted Surfing – SURFaddict,® pioneered showcasing the value of surfing as an important therapeutic tool for people with various disabilities. Data was collected between May 2012 and December 2013. Nowadays surfing is finally being regarded as highly important not only by surfers, therapists and social workers but also by the general public and a number of politicians as a crucial instrument for social inclusion in Portugal. The physiological benefits of participation in sport and physical activity are widely recognized and well established in the research literature. Having a disability or impairment may prevent persons from participating in their social roles and being active members of their community.1 According to Andrews’ approach2 involving the benefits of participation in sport identified in the literature, the evident benefits appear to be the indirect outcomes of the context and social interaction possible in sport rather than the direct outcome of participating in sport. The long-term health benefits of sports have long been established for people with or without disabilities, but those who have some kind of disability tend to be marginalized members of society.1,3,4 On the other hand, a review of the literature confirms that individuals, especially children and youngsters, tend to move to indoor spaces when they are upset or anxious.5 The outdoors offers a rich landscape of sensory experiences that stimulate the whole body, whereas enclosed indoors environments have regulated air, temperature, sound, smell, and texture so the sensory range is much more limited. As an outdoor sport and with water in the background in constant motion, surfing appears as a great option compared to traditional sports. It has a broader approach, covers several areas of occupational performance (ADL´s – Activities of Daily Living such as dressing, bathing/showering, personal hygiene and grooming, functional mobility, etc. ; community mobility; safety and emergency maintenance; Education/Work and educational participation; Play, Leisure and Social Participation), as well as various physical (range of motion, balance, strength, etc. 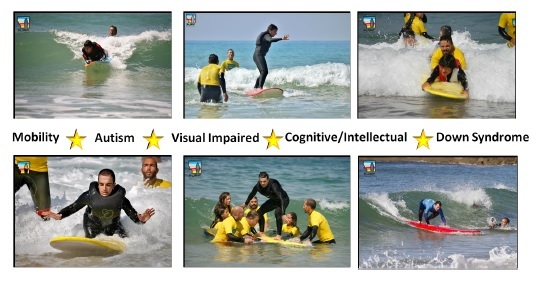 ); sensorial (vestibular, taste, smell, proprioceptive, and touch functions) and psychosocial (affective/emotional, cognitive and perceptual) skills of the individual, in one single activity.7-9 Adapted surfing can play a significant role in the life of a person with disabilities, just as for any individual. Sport can promote physical well being, combat discrimination, build confidence and a sense of security, while playing an important role in the healing and rehabilitation process for individuals affected by crisis, discrimination and marginalization. We will discuss the intervention of sports projects that aim to promote social inclusion as well as provide rehabilitation through surfing. The specific physical properties of the Aquatic Environment (open water – ocean) play an important role in functional rehabilitation (improving balance, strength and flexibility). It is highly stimulating (sensorial) and has a relaxing effect (motor). The absence of gravity in salt water improves mobility, which improves the cardio-respiratory function and is an integral muscular workout. Finally, the pleasure it provides is also an important factor. Regarding the Environment – Individual Interaction, the beach and shoreline are environments with a wide range of stimuli (salt water, wet and dry sand, seaweed, rocks, aquatic fauna and flora), so it provides a wealthy approach in sensory integration terms. Considering this, we will describe in more detail some examples of the various types of sensory stimulation experiences in surfing: (a) visual: through the reflection and refraction of light on the ocean surface associated with the continuous motion of the waves; (b) gustatory and olfactory: by the taste of the intense saltiness of the oceanic water and the smell of the sea and algae that is more noticeable during low-tides; (c) tactile and proprioceptive: issues like buoyancy, sliding over the surface of the sea, the simple passage of the hands through the water as they paddle and take-off on the wave, or the tactile stimulation of the feet on the sand and on the surfboard deck; (d) auditory: through the sound of the waves and the movement of the sea; and (e) vestibular: by the constant imbalance and rebalance intrinsic to this activity. In relation to the Individual – Coach / Therapist Interaction, the trust relationship between the instructor or therapist and the adapted surfer allows the individual to explore his/her intra-personal conflicts and find solutions. Expressing emotions and sharing feelings (from joy to frustration); non-verbal issues like look or gaze, physical presence, touch, movement; engaging in intrapersonal and interpersonal interactions; and improving self-concept and self-esteem are all part of these relationships. Concerning Group Interaction, although surfing is not team sport, adapted surfing is done by a group of people with and without disabilities, which contributes in a playful way to the motivation of a group. It establishes a suitable climate for socialization and interpersonal interaction as well as develops social skills, leadership, mutual respect, mutual help. The main purpose of this case study is to demonstrate how surfing can be an important tool to promote physical health and well-being, mental health and psychological well-being along with the social interaction and inclusion of persons with disabilities, regardless of their age or disability. The present data has been collected by the authors since May 2012, and this paper presents the early findings of an ongoing project (SURFaddict® – Portuguese Association of Adapted Surfing) using only a small sample (the first two years of activity). Work (employment interests and pursuits, which includes “…identifying and selecting work opportunities based on assets, limitations, likes, and dislikes relative to work…”; as well as “…employment seeking and acquisition…”, which includes “…identifying and recruiting for job opportunities; completing, submitting, and reviewing appropriate application materials; preparing for interviews; participating in interviews and following up afterward; discussing job benefits; and ﬁnalizing negotiations…”). Based on these Areas of Occupation, we were able to establish several therapeutic goals for people with disabilities based on their roles in society. The goals utilized a pleasant activity, were based in a specific context, reinforced the positive aspects they can play in everyday life, and fought the stigma associated with disabilities. People with disabilities also explored issues related to education and work activities including possible employment opportunities such as working in the adapted surfing industry, manufacturing devices and materials such as surfboards or wetsuits or embarking in competition as a high-performance athlete on the best paddle boards. The Portuguese Association of Adapted Surfing – SURFaddict® has used this rehabilitation and inclusion background since May of 2012. It has organized events at several beaches along the Portuguese coastline (Mainland and Portuguese Islands), providing all the accessibility conditions for surfing and a team of volunteers who guarantee safety and support for the activity. Everyone – regardless of his or her disability – was able to experience catching a wave. SURFaddict® also provided specific training to surfers and surf schools, preparing them to work and surf with people who have different types of disabilities. Additionally, adapting sports equipment makes participation in surfing more inclusive with the use of custom-made and adapted surfboards and wetsuits. These adaptations are available and specially designed by an occupational therapist receiving valuable input from experienced surfers with disabilities. One other crucial topic was adapting the beach for people with disabilities based on the physical barriers of the environment. Doing so assists with the promotion and development of projects and activities for coastline accessibility especially when considering the equipment and infrastructure supporting the beaches. Surfing can be seen as bringing added value in the prevention and treatment of many pathological conditions by contributing to social inclusion, helping to prevent sedentary lifestyles and stress, improving self-esteem and encouraging teamwork. In addition it stimulates the protection of the environment and quality of life. However, there is still a lack of information and studies about using surfing as a therapeutic tool. Additionally, there are few surfers and surf coaches with specific knowledge about disability. With an average of five events per year, SURFaddict® has provided opportunities for more than three hundred persons with disabilities to be able to surf. Their disabilities have ranged from limb amputations, spinal cord injuries, Downs Syndrome, autism, spina bifida, cerebral palsy, and visual impairments, among others. In comparing the numbers and types of disability (Tables I and II), the first year had a higher number of participants with a total of 187 adapted surfers in 2012 and a total of 134 adapted surfers in 2013. After examining the adapted surfers in 2012 in more detail, it can be seen that of the 187 adapted surfers, there were 86 with mobility impairment (19 female – 10%; and 67 male – 36%); 4 with visual impairment (all males – 2%) and 97 with intellectual and cognitive disabilities (46 female – 25%; and 51 male – 27%). In 2013, although there was a slight decrease in the total number of adapted surfers, with 53 fewer participants than the previous year. Even with the decrease, there was a more diverse sample considering the gender and kind of disability, with 78 with mobility impairment (35 female – 26%; and 43 male – 32%); 21 visually impaired (10 female – 8%; and 11 male – 8%) and 35 with intellectual and cognitive disabilities (12 female – 9%; and 23 male – 17%). Adapted surfing events are attracting a number of participants, several of whom attended consecutive events in the same year. Social networks such as Facebook® were used to advertise the events. Participants were asked to provide feedback about these events after their participation. Feelings such as fear, anxiety, and apprehension were frequently observed in the beginning due to the newness of the activity, lack of experience and training, and the absence of previous contact with surfing. During and after the practices participants expressed emotions such as pleasure, overcoming, autonomy and happiness. Surfing has been steadily growing in Portugal over the last few decades not only as a sport, but also as a social and economic activity. Surfing can be seen as bringing added value to the prevention and treatment of many pathological conditions, which contributes to social inclusion, the avoidance of sedentary lifestyle and stress, improvements in self-esteem and encouraging teamwork as well as stimulating the protection of the environment and quality of life. However, there is still a lack of information and studies using surfing as a therapeutic tool and little research that includes surfers and surf coaches with specific knowledge about disability. The Portuguese Association of Adapted Surfing was a pioneer in showing the value of surfing as a therapeutic tool for people in Portugal with different disabilities. Surfing is finally being regarded as highly important in Portugal, not only by surfers, therapists, and social workers but also by the general public and politicians. The organization’s strategy for the next years will focus on showing how social inclusion development led by surfing will require the professionalization of surfing coaches in Portugal. Sport, physical activity, and play are identified in the Convention on the Rights of Persons with Disabilities12 as providing support for the increasingly well-recognized right to participate in sport and physical activity. Adapted surfing can and should be seen as bringing added value to the prevention and treatment of many pathological conditions because it contributes to social inclusion, improves self-esteem, facilitates teamwork, discourages sedentary lifestyle and exclusion (self and social), as well as stimulates protection of the environment and enhancing the quality of life. Surfing can play a significant role in the lives of people with disabilities by promoting physical well being, combating discrimination, building confidence, and playing an important role in the rehabilitation process. Four major factors were identified through surfing: Aquatic Environment; Environment – Individual Interaction; Individual – Coach/Therapist Interaction; and also Group Interaction. The researchers’ conclusion in regards to the Portuguese Association of Adapted Surfing is that given the low frequency of activities that have been analyzed, there is a need to increase the number of activities that are analyzed per year in order to obtain a more extensive sample that can more explicitly determine the true therapeutic results from surfing. In this way, the main therapeutic benefits for each group of persons with disabilities can be obtained with the aim of improving future interventions by finding the therapeutic indication patterns for each group. We hope in the near future that adapted surfing will gain more attention from governmental and non-governmental organizations in order to obtain more funding to support these programs. More funding would enable researchers to conduct this kind of work more often, and produce more extensive data to support the case for the usefulness of adapted surfing. 1. Parnes P, Hashemi G. Sport as a mean to foster inclusion, health and well-being of people with disabilities. Literature Reviews on Sport for Development and Peace; 2007. p. 124-157. 2. Andrews J, Andrews G. Life in a Secure Unit: The Rehabilitation of Young People Through the Use of Sport. In Social Science and Medicine. 2003; 56. 3. Kidd B, MacDonnell B. Peace, sport and development. Literature reviews on sport for development and peace. Toronto: University of Toronto. SDP IWG; 2007. p. 158-194. 4. DePauw K, Gavron S. Disability Sport, Human Kinetics. 2nd Edition. Illinois; 2005. 5. Stephenson A. Opening up the outdoors: exploring the relationship between the indoor and the outdoor environment of a centre. Early Childhood Research. 2002; 10: 29-38. 6. Ikelberg J, Lechner I, Ziegler S, Zöllner M. Fun inclusive: Sports and games as means of rehabilitation, interaction and integration for children and young people with disabilities. 7. Lopes J. Surfing as a Therapeutic Method. Regional Planning Directorate of Public Health. Regional Secretariat for Social Affairs. Good Life Magazine. Madeira Island. 2006; 21. Culture Conference. Portugal: Rip Curl Pro Surf Peniche 2012. October 2012. 13. Sherrill C. Adapted Physical Activity, Recreation and Sport: Crossdisciplinary and Lifespan. Adapted sports for people with disabilities and the importance of sport in successful rehabilitation. Boston: WCB/McGraw-Hill; 2003.